Head back to the steaming tropical rainforest this week with Slots Capital Casino as they launch another new jungle-themed slot game, Johnny Jungle and the Hidden Temple slot game. Until Saturday you can get 20 free spins on the new game and then all through October you can claim another 50 free spins. New jungle-themed slot has expanding wild and free spins bonus feature. Prior deposit in 2017 required; available September 28 to 30, 2017 only. Cash out up to $180; 60X wagering requirement. Prior deposit in October required; available October 1-30, 2017 only. Johnny Jungle is on a quest to discover hidden treasures and lost cities. His Compass, Binoculars, Two-way Radio and Safari Knife spin on the game’s five reels along with the treasures he seeks including rare Orchids, Golden Coins, and mystic Idols. Three or more Monkey symbols trigger free spins. During free spins, the Johnny Jungle icon is a Sticky Wild– it sticks to the reel and triggers a re-spin. Three or more Golden Idols initiate a bonus game where players choose an Idol to reveal an instant prize. 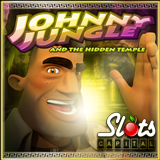 Johnny Jungle is now available in Slots Capital’s download and instant play casinos. Johnny Jungle Mobile, now in the mobile casino, is designed specially for smartphones and tablets. Slots Capital Casino offers dozens of unique online casino games from Rival Gaming which are enjoyed by players all over the world. Details about this and other current casino bonuses are available at http://www.slotscapital.lv/promotions/bonuses.